Here’s what’s up in the world of TV for Monday, April 1. All times are Eastern. 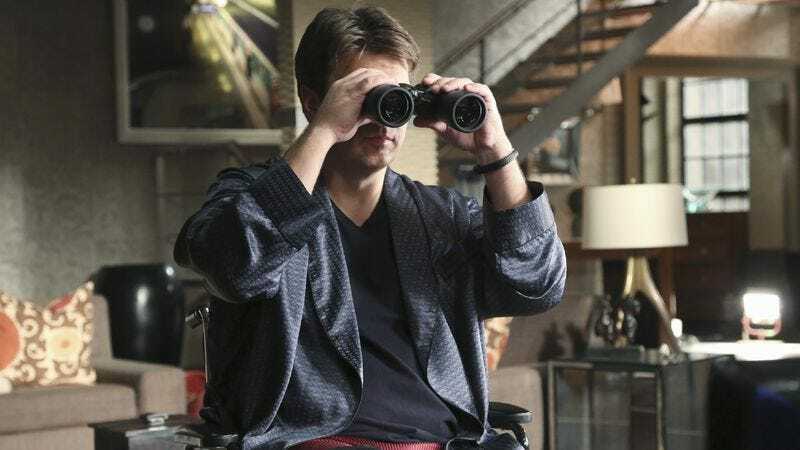 Castle (ABC, 10 p.m.): Who’d have predicted, back when this show started as a half-remembered mid-season dream, that it would be the series that got Nathan Fillion to 100 Episodes? Who’d have predicted that we’d cover it for a time, before realizing only five or six of you were reading about it? And who’d have predicted that we’d task Phil Dyess-Nugent to cover the 100th episode as a kind of cruel April Fool’s joke, one designed to give you something you once loved, then yank it away again? We’re just that big of bastards. Don’t cross us. Ever. Adventure Time (Cartoon Network, 7:30 p.m.): This week’s episode is entitled “A Glitch Is A Glitch,” which makes us hope that Sarah Silverman has joined the voice cast as Wreck-It Ralph’s Vanellope von Schweetz, because she’s the greatest character ever. Oliver Sava would be fine with just a cameo. The Carrie Diaries (The CW, 8 p.m.): Very quietly, we’ve gotten to a point where next week’s episode will be the season finale, and since only one or two people are watching this show, it may be the series finale. Carrie Raisler wants to know if Carrie meeting Miranda will be like Superman meeting Batman. Regular Show (Cartoon Network, 8 p.m.): Mordecai and Rigby attempt to win a prize on a Japanese game show, and if you read that recent Wired magazine article about Japanese game shows, you know what that means: nothing but nut-shots, glorious nut-shots. Alasdair Wilkins would review that weekly. The Following (Fox, 9 p.m.): This week’s episode is called “Whips And Regret,” which is what reviewer David Sims calls “Thursday,” because he’s that giant, albino assassin from The Da Vinci Code. We’re actually kidding. David’s not Opus Dei! He’s not even Catholic! He’s Judge Turpin from Sweeney Todd. RuPaul’s Drag Race (Logo, 9 p.m.): After taking last week off for reasons we still don’t understand, America’s—okay The A.V. Club’s—favorite reality show returns with an episode called “Drama Queens.” We don’t know what will happen, but Oliver Sava hopes someone ascends to the Heaviside Layer. Bates Motel (A&E, 10 p.m.): After a couple of weeks of things toodling along in atmospheric mode, the tension turns up quite a bit in an episode that gets Norman Bates into a predicament of his own making, then watches as he tries to find his way out. Todd VanDerWerff escapes his predicaments with gunfire. Revolution (NBC, 10 p.m.): With an episode named “Ghosts,” we can only assume that this show, too, is getting in on the haunted place reality show craze by sending all of the cast members into the White House after dark to capture Abraham Lincoln’s spirit. Les Chappell would prefer Chester Arthur. Top Of The Lake (Sundance, 10 p.m.): “Secrets surface at Laketop,” says TV Guide in the least helpful episode description in the history of the world. Brandon Nowalk, subbing in for the absent Scott Tobias, suggests an episode description for Cheers: A bunch of people sit around a bar and crack jokes all night. Batman: The Animated Series (1 p.m.): In an episode entitled “Legends Of The Dark Knight,” we’re going to assume that Frank Miller comes onscreen and rants for several hours about the state of the American economy or the failure to respond to terrorism or whatever. Oliver Sava will transcribe it all. The Gossip Game (VH1, 9 p.m.): For some reason, VH1 thinks we’d like a reality show about people working for gossip publications in New York City, like TMZ, only there will be representatives from all the gossipers, like some sort of League of Nations of Gossip Sites, just like Woodrow Wilson wanted. Kind-Hearted Woman (PBS, 9 p.m.): Filmmaker David Sutherland takes viewers inside the life of Oglala Sioux woman Robin Charboneau as she attempts to win custody of her children from her ex-husband, further her education, and deal with wounds from her sexual assault. Phil Dyess-Nugent has the review. Monday Mornings (TNT, 10 p.m.): A couple of you talk about this pleasant enough medical drama every week in comments, suggesting that we should be covering it instead of some of the other crap we cover. Which, maybe! But a.) nobody’s watching it, and b.) it’s not that good. Still, we acknowledge it exists. Kristen Schaal: Live At The Fillmore (Comedy Central, 11:59 p.m.): We may offer up a review of this new comedy special from the ever-delightful Kristen Schaal, if we have our druthers and/or a screener. But even if we don’t, we wanted to let you know there’s a fresh hour of piping hot comedy from her. Snakes On A Plane (Reelz, 8 p.m.): Remember that wacky year when this was all the Internet could talk about, and then we collectively got Samuel L. Jackson to say he’d had it with these motherfucking snakes on this motherfucking plane, and then the movie came out and kinda bombed? Yeah, we do, too. Angels In The Outfield (TCM, 9:30 p.m.): TCM celebrates the return of America’s finest team sport by airing a whole evening of movies that intertwine the fantastical with the pleasures of the national pastime, including this, the original version of the story about God himself taking interest in the game. MLB Baseball: Phillies at Braves (ESPN2, 7 p.m.): There might be an exciting NL East race this year, with these two teams and the Nationals all looking like they could be pretty great. And then there are the poor, poor New York Mets, over whose fates David Sims will surely spend all summer weeping. Again. The Walking Dead/Talking Dead (Sunday): First, Zack Handlen covered the third season finale of America’s favorite zombie show and found it more enjoyable than many of you did. Then, Sonia Saraiya covered the finale of America’s favorite zombie-themed talk show and found it… okay? Sort of?